How long do you think the longest linocut in the world is? Well, the answer lies at Newcastle City Library – it’s a whopping 33m long! Created by over 1000 children and adults across England and Wales, with contributions from across the world, the linocut was made as a celebration of teamwork for the 2015 Rugby World Cup. Unsurprisingly, the monster cut was added to the Guiness Book of World Records and there’s an opportunity for you to see it in all its glory until 30th October. Shakespeare’s Hamlet is one of The Bard’s most enduring plays, the tale of the Danish Prince whose desire for revenge leads to tragedy. It’s been performed by some of the biggest stars in the world but this production really is unique: it’s the first time that the play has ever been performed by an all-black cast in Britain. Directed by Jeffery Kissoon (who has previously worked with the RSC), this new production puts a fast-moving, contemporary twist on the classic, making for a very striking contribution to Shakespeare’s 400th anniversary. If you can’t make it on Wednesday, there’s also a first performance on Tuesday! 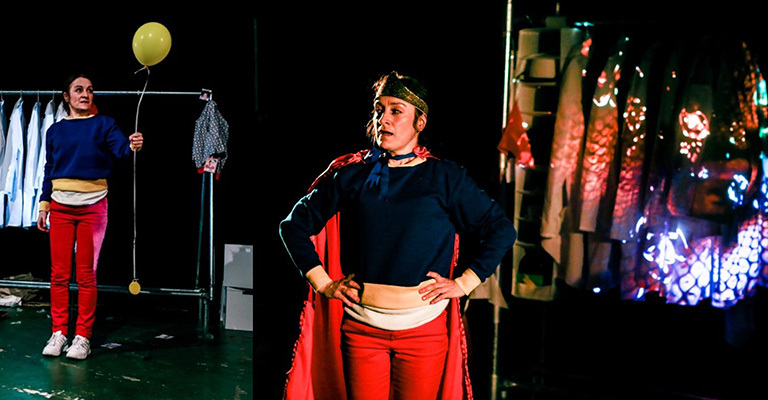 Presented by Mad Alice Theatre, She Wins All the Races is performed solely by Shelley O’Brien and is based on her true story of growing up with two brothers born with Duchenne Muscular Dystrophy. If that sounds a little bit heavy for the kids, don’t worry: this is actually a celebration of courage and resilience in the face of adversity, a positive tale of succeeding against the odds. It’s jam-packed with quirky sketches about stealing the Priest’s biscuits and even has a little bit of ABBA! One of the region’s biggest literary events is gearing up for another year, and this time promises to be bigger than ever! The festival brings together a huge range of authors in a diverse programme of events. Everyone from MPs Chris Mullin and Alan Johnson and Anthony Horowitz to singer-songwriter Kathryn Williams and political activist Laura Bates will be there. There’s also a chance to see some great panels and take part in workshops, so you can have the opportunity to unleash your inner bookworm. The whole festival lasts until 16th October. Get your gladrags and dancing shoes on and join Dance City for a new way to enjoy the film adaptation of everyone’s favourite tribute to ABBA, Mamma Mia! The night starts with a short class by Chris JS Wilson, where you’ll learn a bunch of 70s-inspired dance moves to pull. Before you know it, you’ll be throwing shapes along with the rest of the cast to some of the Swedish pop group’s greatest hits, all leading up to a huge shakedown at the end. You’ll be a ‘Dancing Queen’ in no time! Planning for that big day? Need a few extra items to make your wedding just that bit more special? Then look no further! The Handcrafted Weddings Market at Witham Hall could be just what you need. There will be designer makers selling work at the event, as well as demonstrating and letting you have a go at some of the crafts. Plus, if you’re after something to make that hen or stag night just a little bit different, then there will be lots of ideas for alternative ways to spend your last night as a bachelor or bachelorette!